When Silvia, not her real name, finally mustered up the courage to report sexual harassment by her work senior to her company, she expected the problem to be resolved, even if there was some awkwardness. But after a long battle, it was she who quit at STX. As for Katharina, who was a member of a church choir, it was not “insane” to ask her choir director to stop making sexual remarks. But when she raised the issue with Myeongdong Cathedral, it was her who faced opprobrium, for making a big deal about nothing. Dominica was a victim of dating violence, the perpetrator a member of a left-wing political party that was vocal about gender equality. While she hoped the party’s feminists would support her and take appropriate measures against her abuser, some of the members viewed her claims merely as an attempt to bring him down. All three women were harassed and assaulted in different ways, in different circumstances and by different people, but their cases developed similarly. “By talking to each other, we realized there were many common features to our cases, in the actions of the harasser, the ways each organization has dealt with the issue and the difficulties victims face,” Dominica told The Korea Herald. 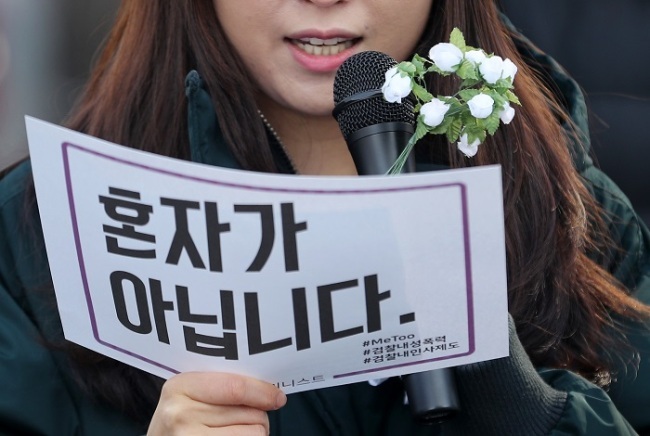 Silvia, Katharina, and Dominica, who are still fighting for their cases, told The Korea Herald that the festering sores caused by sexual harassment should not be considered personal matters, but should be seen as a social phenomenon that must be changed. When victims manage to summon the courage to speak out about their experiences, they are often met with indifference. This causes serious secondary suffering to the victim, the three women said. “I followed the principle steps, to tell the abuser directly about my discomfort. When it did not stop, I reported the case to the chief of the team, then the human resources department of the company and in the end the labor administration body,” Silvia said. But when the investigation started, she had to fight not only her harasser, but the company and her coworkers. “To other workers, I was the one making a big fuss. And though we held about the same position in the company, I was an outsider from another company. When the male senior spread insulting rumors about me, it had the power to impact my private life and work performance,” she explained. She was shocked to find what other workers had written in the witness statement. It was filled with disparaging descriptions of her, such as how she wore dresses that revealed her figure. Katharina experienced a similar reaction when she complained about her choir conductor making sexual remarks to choir members. “They would point out the way you raised the issue, in the first place,” said Katharina, who had no doubt the harasser was at fault. Before she officially requested action by church officials, she had emailed the choir conductor directly. When she filed a complaint with the National Human Rights Commission, the conductor threatened that it was against church regulations to do so. The legal system also makes it hard for victims to reveal the name of the harasser in the first place. “Often victims are sued for defamation and so it is hard to say the name of the abuser. And there are also cases in which a harasser wins a defamation case and claims innocence,” Dominica said. She also added that while revealing these experiences is an ordeal in itself, the reactions the victims face sometimes affect them more severely than the original harassment. Once a case is made public, the abuser often portrayed as a capable person, and the victim as someone trying to bring him or her down by creating a scandal. While Dominica expected the members of the political party to which the perpetrator belonged to sympathize with her, she instead heard some of them, who claimed to feminism and women’s rights advocates, saaying she was trying to bring down the man. “I had faith in their sincerity about women rights. But some of the members from whom I sought help said I was trying to take advantage of them to gain public support for my case,” she explained. According to Silvia, such reactions occur, ironically and precisely because sexual harassment is seen as a serious crime. Often, organizations deal with these issues by shifting responsibility onto the victims. 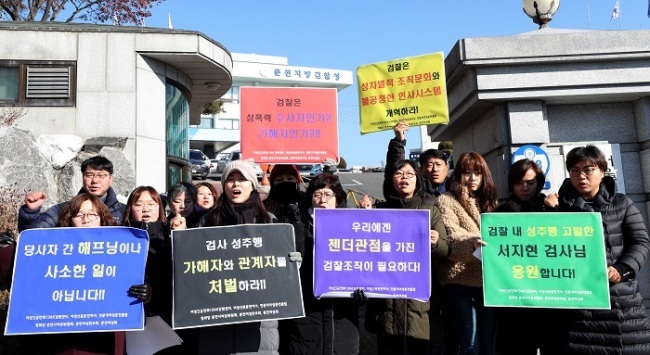 According to a survey by Seoul Women Workers Association, 72 percent of the sexual harassment and attack victims leave the workplace, and among them, 82 percent quit within six months. The three women’s cases illustrate these figures. Katharina was suspended from the church choir for a year, and was told she would have to audition again if she wanted to come back. Silvia was also subjected to disciplinary measures, along with her harasser. While she was not given any work, her harasser was moved to a law firm to do the same work for the company, she added. The three, who have been writing about their experiences and feelings on SNS, are to start “Project A” to deliver their message that sexual misconduct is not the fault of the victims. They also seek to raise awareness of secondary damages, by showing how sexual harassment cases develop. “It will not be serious, but more intuitive and light, for people to easily understand and be careful about their behavior,” Silvia added. They will first start with a series of writing and a podcast channel in the second half of this year. “By pointing out the common features of these incidents, we hope to change the perspectives so that the perpetrators get the criticism they deserve and the victims are protected,” Dominica said.